Kinshasa 16-07-2018 Politics - Joseph Kabila also appointed, in this series of orders, General John Numbi Inspector General of the FARDC, formerly head of the Congolese National Police. 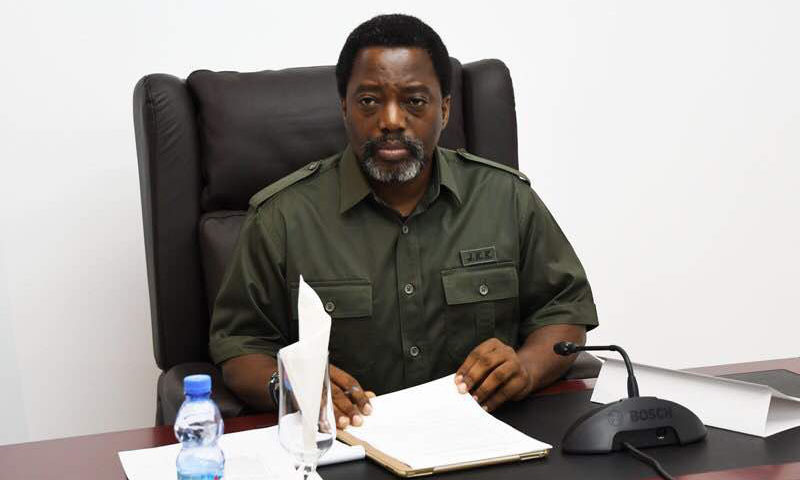 The Head of State, Joseph Kabila Kabange, has just signed a series of orders concerning organization within the Congolese National Army Forces (FARDC). The information was made public by the official media. Lieutenant-General Célestin Mbala Munsense has been named Chief of the General Staff of the Army Forces of the Democratic Republic of the Congo (FARDC), replacing Lieutenant-General Didier Etumba Longila, following a Presidential Order signed on 14 July 2018 made public the same day. Lieutenant-General Amisi Kumba Gabriel and Major-General Bongwangela Jean-Pierre were respectively appointed Deputy Chiefs of Staff in charge of operations and intelligence, administration and logistics. The General Majors Kashale Daniel, Kahimbi Kasabwe Delphin, Yav Jean-Luc and Brigadier General Kilumba Kalala, have been appointed Deputy Chiefs of Staff within the FARDC in charge of operations, intelligence, logistics and administration. Within the FARDC General Inspectorate, the President of the Republic, Supreme Commander of the Army Forces of the Democratic Republic of the Congo (FARDC) and the Congolese National Police (PNC), has appointed General John Numbi BanzaTambo Inspector General of the FARDC, Major Generals Mosuzo Pacific, Kasereka Sindani Etienne ... respectively Deputy Inspectors General for Operations and Intelligence, Administration and Logistics. While Brigadier General Kabwanga Kasewu Symphorose, Lieutenant General Munkutu Kiyama Tim and Major General Mutombo Katalay Joseph were named respectively Secretary General of Veterans Affairs, Auditor General of the FARDC and First President of the High Military Court. Admiral Kabulo Mwanza nvitaKamat and Brigadier General Jean-Pierre Kasongo Kabwik were respectively appointed Chancellor of the Kabila-Lumumba National Orders and National Service Commander (SN). Brigadier General Kabambawa Kabamba Francois was appointed Deputy Chief of Staff of the Head of State in charge of Administration and Logistics. Head of State Joseph Kabila Kabange has, according to other orders made public on Saturday, retired some FARDC general and admiral officers, including Lieutenants-General François Olenga, Kpama Baramoto Kata, Etumba Longila Didier, Dénis Kalume Numbi and Massamba Musumbu Rigobert. Moreover, MM. Didier Etumba and Francois Olenga were appointed respectively military advisor and military officer of the Head of State. Several other orders were also signed on the same date by the Head of State, appointing senior officers, Secretaries General for Defense, commanders of military schools and several other functions within the judiciary of the Army Forces of the DRC. The Head of State nominated posthumously Brigadier General Abiti Manulayi Albert, Ntita Tshibambe Alphonse and Nzumande Yakabo Adrien. At the rank of colonel or captain, President Joseph Kabila Kabange posthumously appointed lieutenant colonels and captains of frigates Mbayi Kabuinda Joseph, Mandi Makuale Jean and Kapema Matule Olivier.